Get a bit more of a feel for some of the Artisans’ Nest Gallery’s creative workers and their art, with interviews, images and insights into their techniques. I am a textile artist and am fascinated with any kind of printing and dyeing onto fabric. I came to textile art rather late in life. Since beginning my art form, I have concentrated almost exclusively on exploring and developing my love of printing onto fabric. My main focus is to manipulate fabric and dye. I use surface design to create images on fabric. 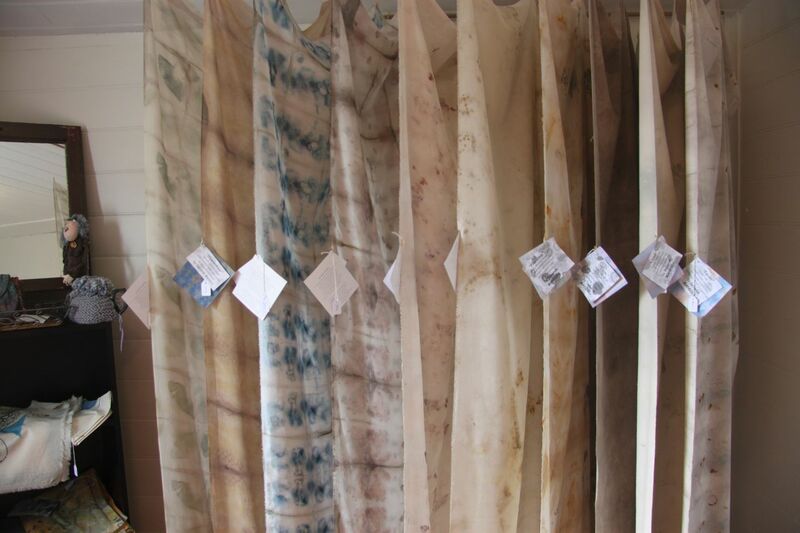 Coming to this art form, not from art school training but from an experimental place, I have created my own original methods for applying dye to the fabrics I love working with, natural fibres like cotton, silk, hemp, linen and bamboo. I started using synthetic, more conventional dyes, but I now almost exclusively dye with plants and metals and love the organic and surprising results. I use flowers, leaves, bark, roots and fruit and mixtures of these to create marks and colours through steaming and I also make liquors of quantities of flora which I use with shibori techniques of dyeing. I collect both native and cultivated plants from wherever I happen to be which is mostly on the South Coast of NSW but previous winters have found me in the tropical north of Queensland. I constantly have a number of pieces in some pot or another and try to curb my impatience and curiosity and leave my bundles for as long as I can to deepen the mark making and colour transfer and add complexity. I am finding this a consuming passion, even more than the printing I began with. It is one of my objectives to preserve the hand-craft of textile art and design. You can read more about Deborah and her career on the South East Arts webpage, here.